Contents: 1. 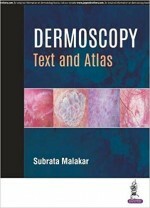 Dermoscopy: a window into epidermis and dermis/Purva Mehta, Subrata Malakar. 2. Dermoscopy: a missing link between clinical dermatology and histopathology/Samipa S Mukherjee and Subrata Malakar. 3. The dermoscope/Samipa S Mukherjee. 4. Recognition of patterns/Sushrut Save, Purva Mehta and Subrata Malakar. 5. Dermoscopic dialogues/Subrata Malakar and Shruti Kulkarni. 6. Color concept through dermoscopy/Subrata Malakar, Samipa S Mukherjee and Surit Malakar. 7. Papulosquamous disorders/Subrata Malakar. 8. Infectious dermatoses/Subrata Malakar and Anjali Pal. 9. Skin tumors/Subrata Malakar. 10. Autoimmune dermatoses/Subrata Malakar.11. Granulomatous dermatoses/Subrata Malakar and Jayasree Puravoor.12. Pigmentary disorders/Balachandra S Ankad, Balakrishna Nikam and Niti Khunger.13. Disorders of keratinization/Subrata Malakar, Priya Diwaker and Surit Malakar. 14. Vascular lesions/Subrata Malakar.15. Dermoscopic surprises/Subrata Malakar and Purva Mehta. 16. Miscellaneous dermatoses/Subrata Malakar, Samipa S Mukherjee, Priya Diwaker and Surit Malakar. 17. Dysplastic nevi/Sushrut Save. 18. Dermoscopy in diagnostic dilemmas/Subrata Malakar and Samipa S Mukherjee. 19. Dermoscopy in therapeutic monitoring and follow-up/Subrata Malakar and Samipa S Mukherjee. 20. Algorithms/Samipa S Mukherjee. Index. Dermoscopy is fast gaining hold in clinical practice of dermatologists across India and the world. Since the inception of this science, a lot of work has been done in white skin especially cutaneous cancers. This text has been compiled by dermoscopy enthusiasts with a vision to guide the students and practitioners to learn and master the art and science of dermoscopy through a structured, detailed and a step-by-step approach. The idea for this exhaustive compilation was conceived when author noticed a dearth of literature in the skin of color, with regards to dermatological disorders apart from cutaneous malignancies. The authors of this book have made their maiden attempt to solve the diagnostic dilemmas and make treatment choices using this noninvasive method of dermoscopy. The format of the book has been kept reader-friendly with uniform headings maintained throughout the text. The keynote message at the end of most of the topics summarizes the important dermoscopic features and the gist of the text elaborated. The plethora of images of a single condition from the author’s personal collection gives a glimpse to the possible variations and presentations under dermoscopy in different clinical scenarios. Novel chapters like ‘The Melanin Module’ and ‘Color Concept in Dermoscopy’ serve as steady foundation for the reader. In this part of the world (India), the incidence of melanoma is extremely rare, hence author have not included dermoscopy of melanoma in the book. Dermoscopy being a relatively new science, there are developments and newer observations being made everyday and the authors have attempted to compile their newer findings in this book.